Cyrodilic Spadetails are fish that can be caught in ponds, lakes, and other bodies of water. 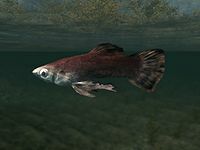 Despite its name, it can be caught in the waters of Skyrim. Fish barrels have a 25% chance of containing Cyrodilic spadetails.